Leigh Carr, SLP, a licensed speech therapist for Genacross Lutheran Services, formerly Lutheran Homes Society, has been awarded an Emerging Leader Grant from Wheat Ridge Ministries. 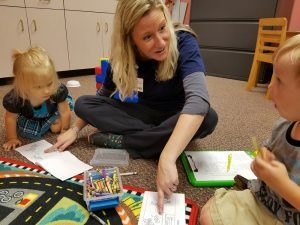 The $10,000 grant will help expand a pediatric speech therapy program, called Play n’ Say, on the Genacross Lutheran Services-Wolf Creek Campus, located at 2001 Perrysburg Holland Road in Holland, Ohio. The grant money will be used for art supplies, books, home exercise programs, standardized testing materials, furnishings for the treatment room, and program marketing. Play n’ Say provides group therapy for children who have speech delays. The children range in age from 2-5 years and meet twice a week in a small group to work on goals for speech and language development. Each session lasts eight weeks and promotes peer modeling, social skills, cooperative play, and school readiness. The program is innovative in that it is intergenerational, with very measurable goals. The children interact with residents from assisted living who themselves are engaged in speech therapy. This interaction provides opportunities for both populations to communicate with each other and improve their speech and language skills. The next Play n’ Say session on the Wolf Creek Campus will begin the week of September 11, 2017, and will meet on Mondays and Fridays from 9:30-10:30 am. Cost is $400 for the 8-week session ($25 per day). For more information and future group therapy session dates, call 419.861.5099. To download a Play n’ Say brochure, click here. Wheat Ridge Ministries provides funding and support for inspired leaders starting new health and human care ministries that encompass a wide range of innovative solutions – from free health clinics to after-school programs, from refugee support to care for older adults. Wheat Ridge efforts support those who are focused on improving the health of the whole person by addressing wellness of body, mind and spirit. They’ve helped thousands of ministries get started. Currently, more than 70 ministries around the world are receiving assistance through traditional Wheat Ridge grants and even more through their WeRaise crowd funding grants. To learn more, please visit wheatridge.org.